The post about “Merry at Misery House” also includes artwork from “Four Friends at Spartan School”. 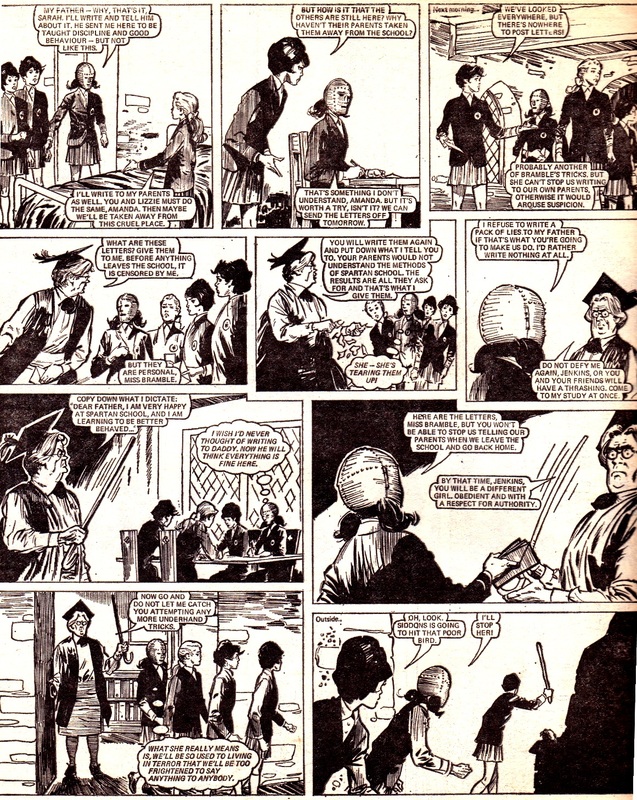 In these earlier stories, the composition of individual panels is mostly based around a middle distance view: the characters are seen full body, or three-quarters, and you get lots of interaction between them. 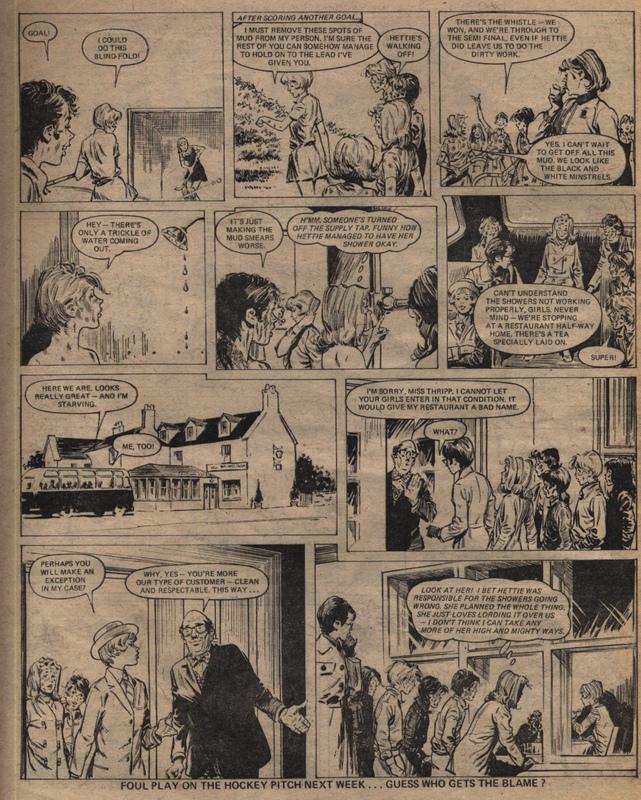 The slightly later story “Friends of the Forest” (above), in particular, gives a ‘closer up’ feel, with tight focus on the faces of the characters. In this example there are fewer panels on a page, too, giving a more open feel. It is really nice to see an artist changing the way they work as they go along and experimenting with new looks; as a reader you feel that it wasn’t just a treadmill or a grindstone, despite the busy schedule that many of the artists must have put in to create so many pages of amazing art. Any information leading to a positive identification of this artist will be very gratefully received. 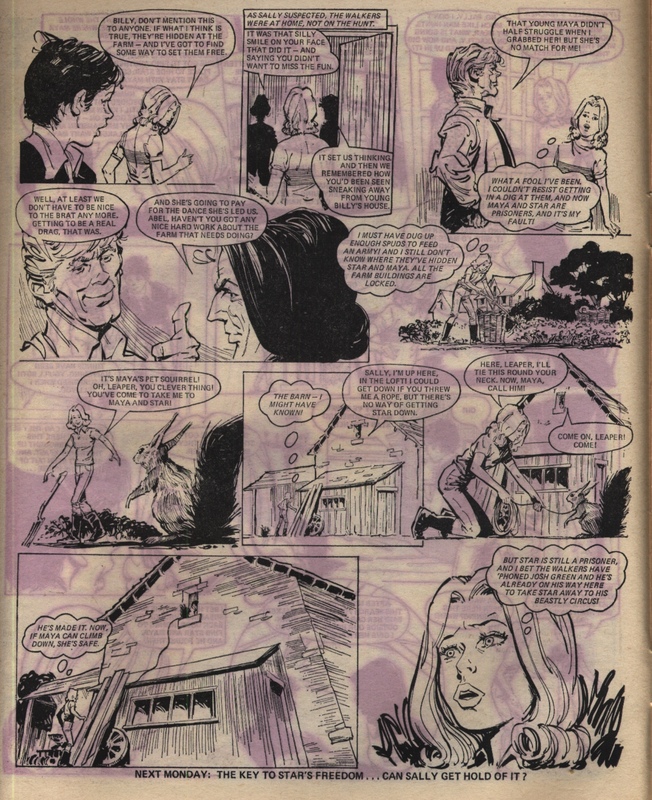 Tammy may have been the first in a new breed of girls’ comics that revelled in dark stories that tortured their heroines. But from the first, Jinty proved she could torture hers just as cruelly. And not even Tammy tortured a heroine as long as Merry Summers here. 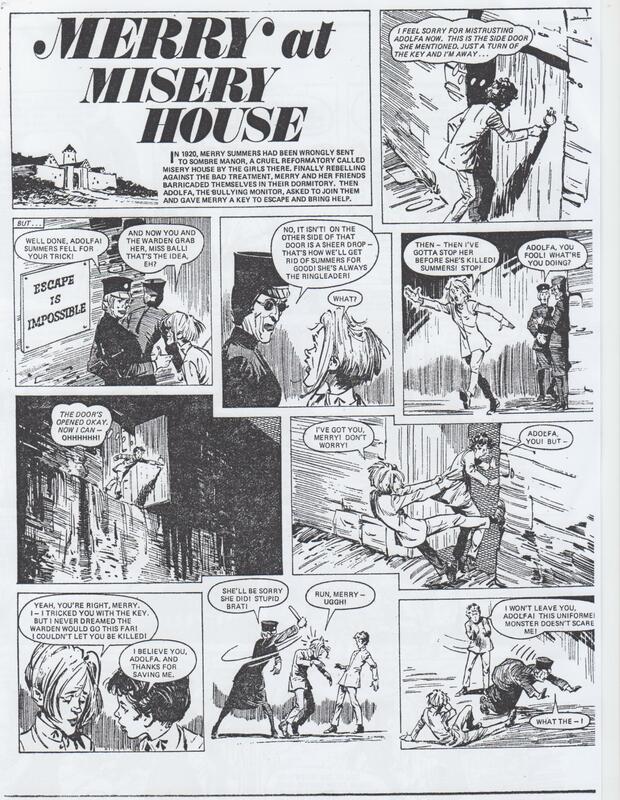 Merry at Misery House was Jinty’s longest running serial – starting in the very first issue and running for over 60 episodes! 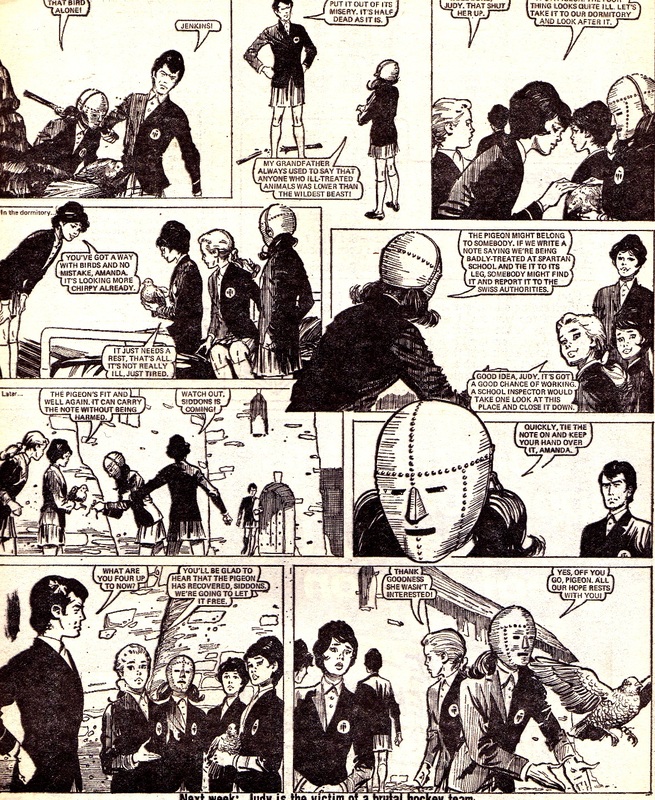 Despite this, Merry never appeared in the Jinty annuals, which seems strange. 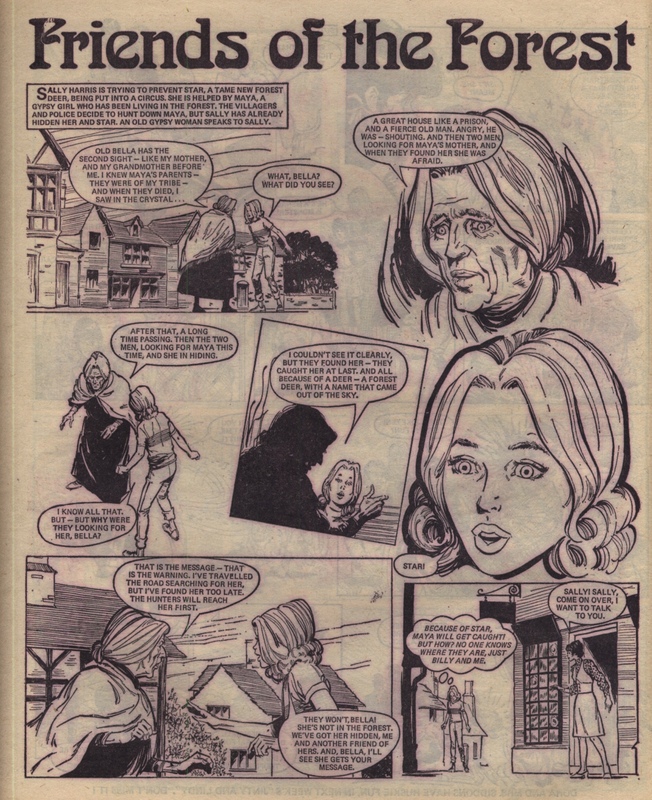 Merry was borne from one of the most popular formulas in girls’ comics – the slave story. The slave story was so popular that if readership was taking a dip, they would bring out the slave story. The slave story was frequent in the IPC titles in the 1960s and 1970s but had faded by the 1980s. However, it carried on in the DCT titles. In a slave story, a group of girls are being used as slaves or held prisoner in an establishment with harsh and cruel conditions. It may be a factory, a workhouse, a school, an underground racket, a quarry, an island, or other settings. The protagonist is the one who rebels against the conditions and out for escape, and so is in for the harshest treatment from the gaolers. Often there is a “toady” character, a prisoner who curries favour with the gaolers and helps to administer the cruelty on her fellow inmates. Sometimes the toady has a change of heart, which is crucial for the resolution of the story, and sometimes not. Frequently, though not always, there is a mystery tied in as well, such as what are the gaolers up to in the secret room or who is the mystery person that keeps popping up to help the girls? Yes, sometimes there is a mystery helper, such as Emma in Tammy’s most infamous slave story, “Slaves of ‘War Orphan Farm’”. Whenever there is a mystery of any sort in the slave story, unravelling it is the key to freedom for the prisoners. Jinty seemed to have fewer slave stories than Tammy. But then she hardly needed to when she had a resident slave story in the form of Merry. In the year 1920, Merry Summers is wrongly convicted of theft (circumstances of which are never explained – we are not even told what Merry was accused of stealing) and sentenced to two years in a reformatory. The reformatory is called Sombre Manor, but it is better known as Misery House for its harshness and sadistic staff. Everything about Misery House is designed to break and torture the spirits of its inmates, right down to intimidating signs everywhere with messages such as “Behave Or Be Sorry”, “No Smiling” and “Nothing Is So Bad It Can’t Get Worse”. The Warden, Miss Ball the guard, and Adolfa, the resident toady of the story, reserve their worst treatment for Merry because she refuses to let the cruelties of Misery House break her spirit, change her chirpy ways, or stop her smiling – not to mention her plans to escape and expose the cruelties of Misery House. The cruelties include being shackled in drip dungeons, pillories, enforced ostracising from other inmates, working a sick girl to the point of death, being farmed out as slave labour, beatings, lousy food, bedding removed in freezing conditions, and a zoo-like enclosure where prisoners are abandoned in wretched conditions to run savage and ragged. One of the greatest strengths of the story is that the Warden and Miss Ball must rate as two of the most brilliantly-conceived villains ever in girls’ comics. Sure, they are cruel, heartless, hypocritical, corrupt and brutal – yet at the same time they are subtle caricatures, a parody of prison brutality, which stops their cruelty from going to utter excess. They are not set out as implicitly evil sadists who are just there to torture and exploit their victims, though of course that is what they do all the time. Of course, there are friends to help Merry along. The most notable of them is Carla Flax, Merry’s best friend. Carla is on her second sentence at Misery House. We have to wonder why she has ever been in a reformatory at all because she does not come across as the delinquent type. Others include girls who have been inspired by Merry’s courageous cheerfulness. Some of them, such as Violet, have been won over from causing Merry trouble to becoming friends with her. The reader of course, is inspired too, and must take great heart from the girl who refuses to stop being merry despite everything that is thrown at her. About half way through the story, we get an exciting change of pace when Merry finally escapes from Misery House. Her motive for escaping is to expose the cruelty of Misery House – nothing about proving her innocence, which is the usual case with serials about with wrongly convicted persons. But fate turns against Merry; she has an accident and gets amnesia, and then gets blackmailed by a criminal. During her time on the run she is almost adopted by a rich couple, but in the end she is returned to Misery House. Back to square one then? Not quite – it is here that the mystery element creeps in, with signs that the Warden and Miss Ball are up to something. For example, the Warden and Miss Ball send the girls out to work for a cruel farmer and make a profit. This is illegal, but there’s worse. They try to blackmail the farmer’s stepson into signing over the farm to him by threatening to have him arrested on trumped up charges. They are foiled in the end but take off smartly with the girls before any authorities are onto them. Eventually the girls discover that the Warden and Miss Ball have been illegally selling off the good food supplies that they should have been receiving and foisting substandard food onto them. This incites them into rebellion and they barricade themselves in. The Warden responds with a plot to kill Merry. When Adolfa finds out, she becomes one toady with a change of heart. She saves Merry – and takes a horrible crack on the head from Miss Ball for doing so – and joins the rebels. The Warden tries to smoke them out, but the fire rages out of control and the girls cannot escape because the gates are locked. But wouldn’t you know it – here come the police in the nick of time. They’ve had their eye on Misery House for a while and arrest the Warden and Miss Ball. They also tell Merry that her name has been cleared (no details on how she has been cleared, just as there were no details on just how she came to be wrongly convicted), and her parents are here to collect her. As for Misery House, it is finished in more ways than one – the fire has destroyed it. Merry is still worried about what will happen to her friends. The parents think their sentences will be remitted. Merry’s friends tell her they will never forget the example she showed them in how to handle oppression. 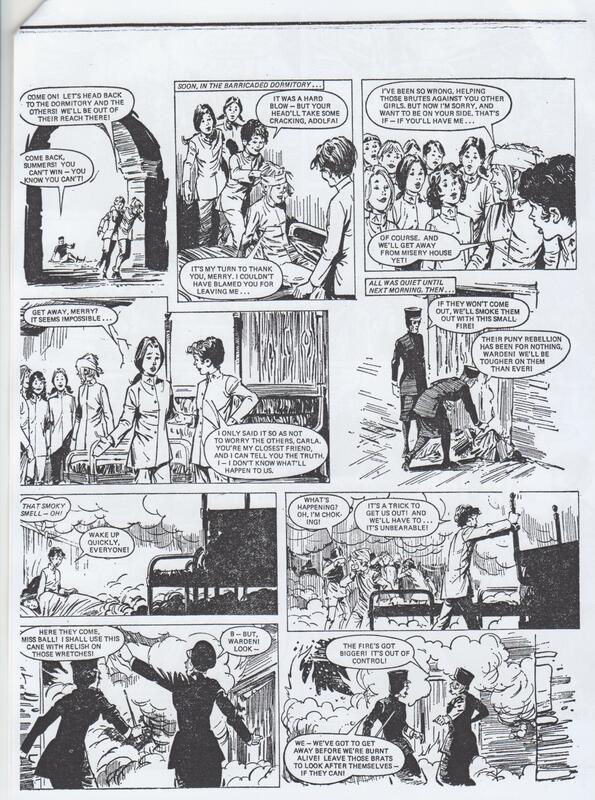 The Terry Magee story “The Four Friends at Spartan School” (Tammy 23/10/71-8/1/72) clearly foreshadows Merry. It even has the same unknown artist, though of course it is a much earlier example of his/her artwork. Spartan School is a special school in Switzerland run by Miss Bramble. The school is designed to instil discipline and compliance into problem pupils. Unfortunately, Miss Bramble’s ideas of discipline go too far and turn into torture and abuse. They include beatings, feeding the pupils poor food, and locking them in dungeons, the pillory, and even iron masks. It is no wonder that the pupils either end up as scared, broken down zombies or joining in the cruelty. Like the Warden, Miss Bramble and her crony, Siddons the prefect, go as far as attempted murder when the girls they especially want to break are making a bid for freedom. But unlike Adolfa, Siddons does not have a change of heart. On the contrary, she is far more evil than Adolfa – in fact, she is the one who suggests the murder while Adolfa draws the line at Merry’s. Judy Jenkins, the heroine of this story, could well be the predecessor of Merry. She likes to play jokes to liven things up a bit. Unfortunately she keeps doing it in class, which gets her into the trouble that sends her to Spartan School. But like Merry, Judy refuses to be broken and her courageous defiance singles her out for the worst treatment. And as with Misery House, Spartan School is physically destroyed (by an avalanche) as well as being shut down by the authorities. 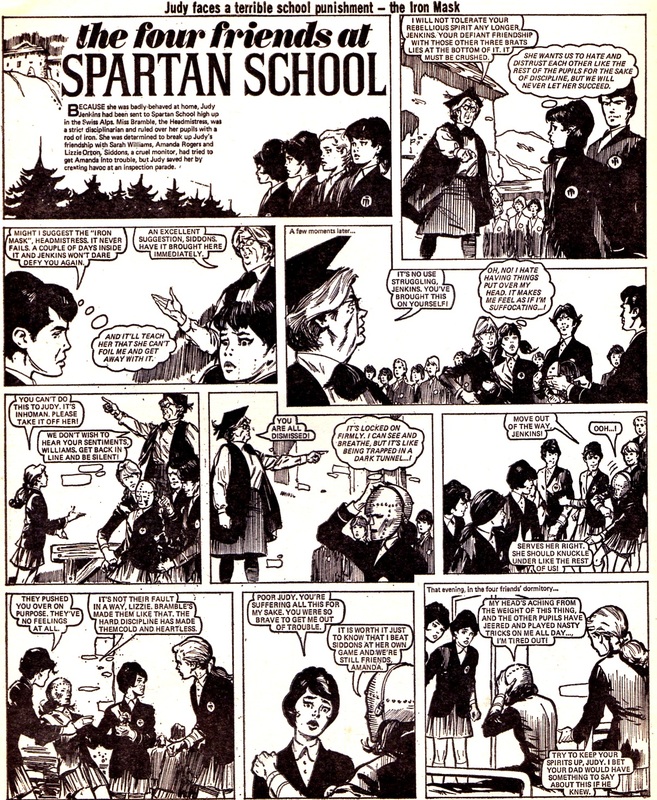 Spartan School was Magee’s first serial, and Merry certainly shows the advances he had made in his storytelling and characterisation since then. For example, while the villains in Spartan School are just plain cruel and nasty in the name of discipline, the villains in Merry show subtle nuances; Miss Ball, for example, displays a sardonic, cruel sense of humour. There are Orwellian touches too, as shown in the omniscent signs plastered all over Misery House. There is also a fascist look about the Warden, who is is always clad in a dark uniform and glasses. The Warden never takes off those dark glasses, so we never see her full face. This has a dehumanising effect on her that makes her all the more frightening – except to Merry, it seems. Ten years after finishing Merry, Terry Magee was writing “The Nightmare” for Battle. The influence of “Merry at Misery House” can be seen in this long-running saga (January 19th 1985 to October 11th 1986). Ian Wilson is kidnapped by SS Hauptmann Grappner and imprisoned in a Hitler Youth camp (at least it’s not a concentration camp). Like Merry, Ian refuses to give in and resolves to escape. He does, and it turns into a far more fugitive story than Merry. But instead of fighting back with smiles and jokes as Merry does, Ian uses the survival and combat skills he has learned. Along the way Hitler himself joins the campaign against Ian after the indignity Ian inflicts on him (below). Congratulations, Ian! 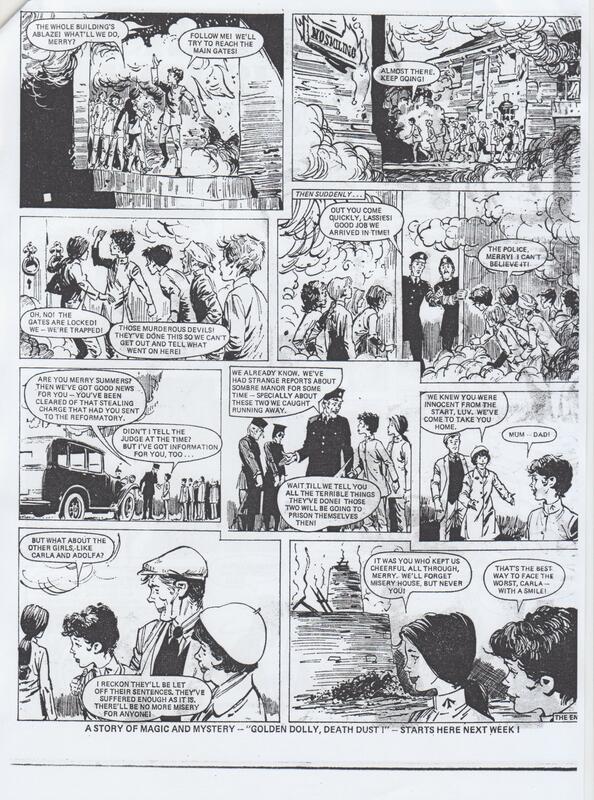 Not many protagonists in British comics can say they have Adolf Hitler for a personal enemy. Art by Jesus Redondo (the original artist of the strip was Mario Capaldi).